Washington Monthly Ranks UC Merced Top-10 in the U.S.
UC Merced ranks among the top 10 universities in the nation for the success of its first-generation and underrepresented students, according to Washington Monthly’s 2017 College Rankings. The university received high marks in areas related to social mobility, placing No. 3 in the nation for graduating Pell Grant recipients at higher-than-predicted rates. It’s also No. 10 in the nation by the same measure for first-generation students, which account for 71 percent of the campus’s total enrollment. In earnings performance — the difference between actual and predicted earnings of students 10 years after starting college — UC Merced is No. 22 in the U.S.
UC Merced offers outstanding value combined with overall quality, according to the Washington Monthly rankings. 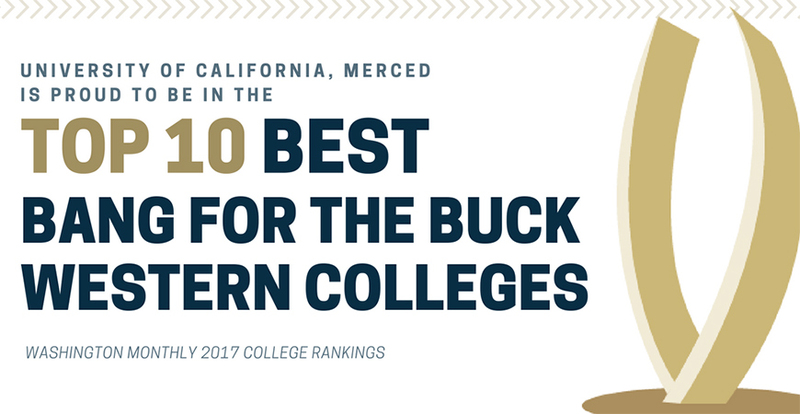 For the second straight year, the university landed in the top 10 in the “Best Bang for the Buck Western Colleges” list, at No. 9. And in the overall National Universities rankings — with criteria that emphasize both academic excellence and economic opportunity — UC Merced placed No. 43.